1995. Acrylic on canvas board. 14" x 17"
Back in the mid 90s I got on this mythology kick (mermaids, fauns, faeries, marshwiggles, etc.). 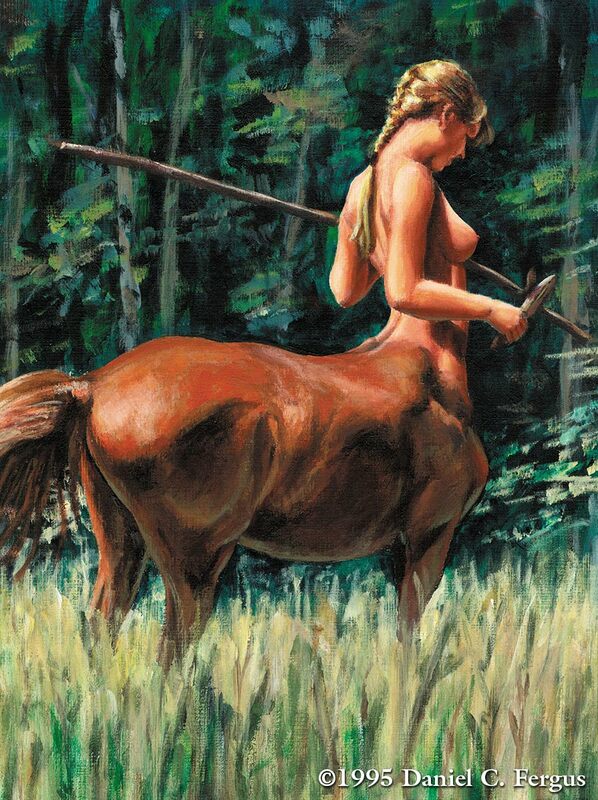 Centaurs were a particular favorite. I did a number of sketches featuring centaurs; some were inspired by specific myths, others by books likeThe Silver Chair. Then there were those like this one that had no specific story, it just started with a doodle. However the first version was pretty awful anatomicaly (the equine part at least), so I photgraphed my sister-in-law's horse for reference and redid the painting...twice (the original was done in my ink & watercolor style). This is also one of my most stolen images. It keeps popping up on Web sites and blogs that don't belong to me without my permission. Can you say "cease and desist?" The owners of those sites can now.